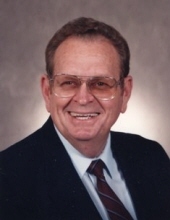 Elmer Jones age 85 of Lexington, Kentucky passed away Tuesday, January 22, 2019 at his home in Lexington. He was a retired member of the Pike County Board of Education and a member of the North Lexington Church of Christ. He was a veteran of the United States Army. Elmer was born at Jamboree, Kentucky on August 29, 1933 the son of the late Holland and Flora Riddle Jones. Along with his parents, he was preceded in death by one brother, Earl Jones and one sister, Magdeline Daugherty. He is survived by his wife, Lois Jones and his daughter, Debbie Jones Daugherty (Roger) of Bluffton, South Carolina. He is also survived by one sister, Norma Jean Mann (Glen) of Stone Mountain, Georgia and a sister-in-law, Florence Jones, of Pikeville, Ky.
To send flowers or a remembrance gift to the family of Elmer Jones, please visit our Tribute Store. "Email Address" would like to share the life celebration of Elmer Jones. Click on the "link" to go to share a favorite memory or leave a condolence message for the family.